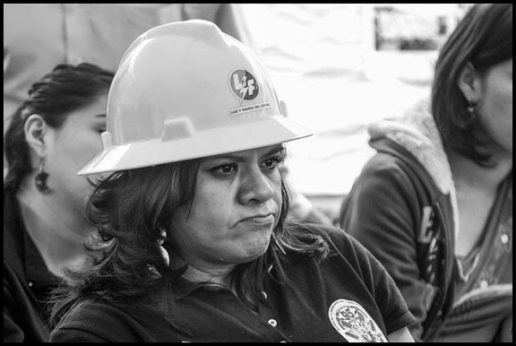 Reporter Rosa Elena Soto, of Acustik Noticias y La Neta Noticias, alleged corruption between Lopez Obrador’s predecessor and the union, over contracts for operating the huge Necaxa hydroelectric power station. “Many of these contracts have indications that they were plagued by corruption,” she charged. In his response, AMLO called the union “possibly the most democratic union in Mexico’s history, until they viciously destroyed it in the neoliberal period.” Noting that its 44,000 members had been fired in 2009, he called for a solution to the conflict. Any corruption, he emphasized, wasn’t attributable to workers but to companies that took advantage of the situation. But López Obrador also called for consulting the discredited former leaders of the union, who had accepted government’s payoffs after the firings. 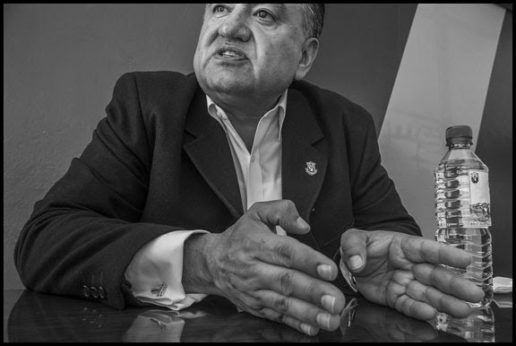 That solution is a cooperative that has taken over many of the facilities where SME members formerly worked, including the Necaxa power station in the reporter’s question. This “novel solution” represents the union’s hope of putting back to work the thousands of electrical workers thrown into the street a decade ago. When López Obrador carefully noted the union’s reputation, he was acknowledging the importance of its 100-year history on the Mexican left. The Mexican Electrical Workers Union, the oldest democratic union in Mexico, was founded in 1914 when the armies of Emiliano Zapata took Mexico City. Almost a century later, in 2009, the Felipe Calderón administration attempted to destroy the union and the nationalized company that employed its members. 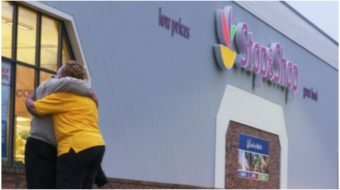 But thousands of the SME’s members refused to give up their union. Instead, they spent the next eight years “en resistencia” (in resistance). In 1937, Amendment 27 of the Mexican Constitution made the oil and electrical industries the property of the state. Then, in 1949, the Comisión Federal de la Electricidad (Federal Electricity Commission, CFE) was established to provide power to all of Mexico-except for the area served by LyF. Nevertheless, private companies like Luz y Fuerza continued to operate under government concessions. The SME contract with LyF carried strong protections, such as the guarantee of a safe workplace, vacation time, sick leave, and leaves of absence. 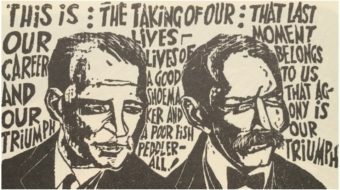 A fund helped workers find adequate housing, and even build or buy a home. Workers also received an aguinaldo [an extra month’s salary distributed at the end of the year] and a savings fund in which the company matched workers’ contributions. “Basically, our contract meant that we had the minimum conditions for a decent life,” says SME’s External Affairs Secretary Humberto Montes de Oca. 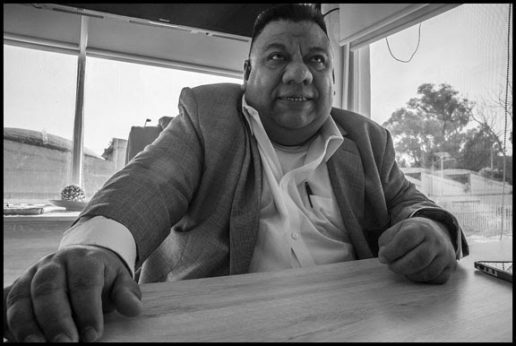 “It wasn’t some kind of privilege, but rights that cost a lot to win.” The contract set the standard for electrical workers-not just in Mexico-but throughout Latin America, Montes de Oca says. It also gave the SME the ability to mobilize workers in support of progressive politics, giving it an important presence on the left. 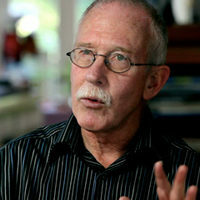 SME’s progressive contract and politics made it a target of large corporations and their political allies, especially when the SME opposed privatization and corporate economic reform in the 1990s. 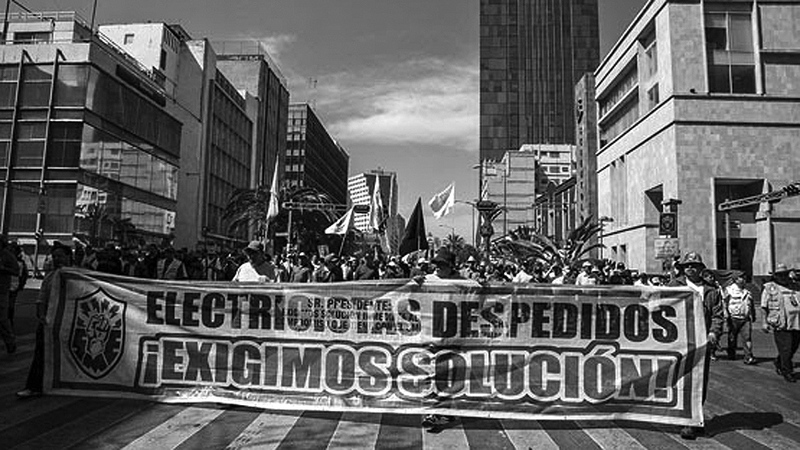 In 1994, President Carlos Salinas de Gortari reversed the push towards nationalization of the electricity sector when he issued a decree allowing private companies to generate electricity and sell it to the CFE-despite the constitutional prohibition on doing so. The first foreign electric generators, led by San Diego’s Sempra Energy, began to build plants along the U.S. border in 2002. As foreign companies moved in, government managers of LyF stopped investing in the modernization of the generation and distribution systems for the publicly-owned utility. The company was forced to buy electricity at high prices from CFE and sell it at low prices to government and large- scale users. LyF’s deficit ballooned, while the company’s infrastructure deteriorated. In the late ’90s, President Ernesto Zedillo proposed an electricity reform to open the electricity market to further private investment. He also cut the rate subsidy for the poor, and rates shot up 30%, notes Montes de Oca. The SME responded by forming the Frente Nacional de Resistencia a la Privatizacióon de la Industria Electrica (National Front of Resistance to the Privatization of the Electrical Industry) in 1999. In three weeks, it collected 2.3 million signatures on a petition opposing privatization., and Zedillo then abandoned his proposal. A week later, President Calderón declared Luz y Fuerza “non-existent” and ordered the army and police to occupy the generating plants and all other facilities. The SME was also declared “non-existent.” The government seized $80 million in union funds and tried to expel it from its union hall, where the SME’s history is celebrated in a huge mural by David Alfaro Siqueiros. The union’s members defended the hall, but all 44,000 were ultimately fired. The CFE took over the operation of LyF facilities and SUTERM supplied the workers to replace the SME members. In reality, one purpose of Mexico’s electricity reform is to permit the generation of electricity in one country (the U.S. or Mexico) in exchange for its sale and use in the other. Many multinational corporations have entered the markets. And because this year Mexico ratified the ILO Convention No. 98 about collective bargaining, unions can organize in those companies. So it’s extremely important that we have ties with unions in the U.S., to work together to organize and improve the conditions of the workers. Yet these companies operate with no collective bargaining agreements and avoid it by subcontractings. We want to force them to recognize unions and bargain. Our union has a national registro (legal status) that allows us to represent workers in any part of this industry, in any company. And while the transmission lines can only be operated by the Federal Electricity Commission [which has a company union, SUTERM] the government is not obligated to bargain only with it. The workers have the freedom to choose what union they want to belong to. Today, in the union’s new Luz y Fuerza cooperative, some SME members have been able to return to work in the electrical sector. Some of them work for the cooperative itself, and others for a partnership called Fenix, between Mota Engil, a Portuguese construction company (51% of the shares) and the SME (49% of the shares). Fenix operates two generating stations, including the large Necaxa complex, and employs 49 people. Once it begins operating other stations returned by the government, the union hopes it will employ 500-600 people. About 1,400 people currently receive some income from the cooperative. The other 15,000 people, including some who’ve already retired, are still “in resistance.” In the nine years since its members were fired, SME members have done many jobs, with some in the United States. Many returned to school and can now perform more sophisticated work, including as engineers. The union hopes they’ll return to help bring the recovered plants on line, according to Montes de Oca. In 2019, providers other than the CFE will be able to purchase blocks of energy and sell it to consumers in Mexico City. When this happens, we are planning to set up a project called Subase. We already have trained people who’ve done this job for years. We know the management systems. That could reintegrate 2,000 workers. Electricity rates have gone up 700%, and there’s great dissatisfaction with CFE’s service provided. It cuts off service to people too poor to pay. The members of SUTERM working for the CFE just come and cut their power. People angry about this have been organizing with us in the National Assembly of Electricity Users. They’ve declared a strike in payments to the CFE. Membership in the Assembly is now up to 60,000, and we’ve filed a complaint with the Federal prosecutor for consumer affairs. After we recovered our workplaces and went inside, we had to rebuild everything. It took a lot of work. We had to learn how to bid on jobs, and we are now offering over 500 different services, from cleaning offices to building generation stations. We have more than 400 engineers. We have about 4,000 people who can work on live lines, and we run generation plants, and install photovoltaic cells. We’re even setting up a dining hall because we have chefs in the union and a textile department that makes our uniforms. We’re all cooperating so that we can go back to the kind of work we did before. As the exchange in López Obrador’s press conference makes clear, the relationship between these two old allies is not going to develop without obstacles and frustrations. SME members were among López Obrador’s strongest allies when he was mayor of Mexico City from 2000 to 2005. 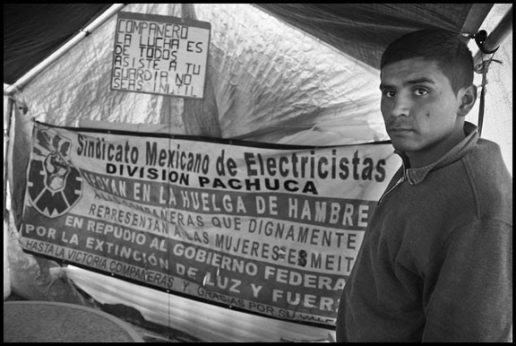 When he ran for President in 2006 and was then denied victory by electoral fraud, SME members heeded his call to occupy Mexico City’s main thoroughfare, the Reforma, in tents for months. And although the SME, because of its rules about political independence, did not endorse his 2018 presidential campaign, the union’s members were overwhelmingly supportive. SME members could be rehired by the CFE into the jobs they did before 2009, as the scuttled deal with Blake Mora would have provided. The new labor legislation already in the Mexican Congress, initiated by Lopez Obrador’s party Morena, would allow the SME’s existence inside the CFE, perhaps eventually even challenging the SUTERM’s right to represent all workers in the enterprise. That would shift the politics in Mexican labor sharply to the left. 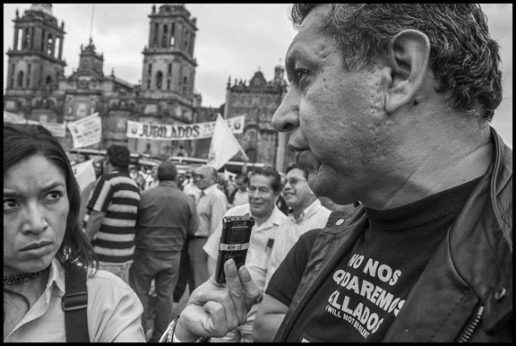 In the short term, however, the main issue will be the level of support the López Obrador administration will give to the Luz y Fuerza cooperative. Contracts to help build and operate solar and wind farms, and new direct-current transmission lines bringing the power to Mexican cities, would create many jobs for SME’s members. Putting up a roadblock to that was perhaps one motivation for the accusations of corruption in Rosa Elena Soto’s question in the press conference, and for the controversy now grabbing headlines in the Mexican press.